Stitching, as a general term, encompasses anything from the practical – dressmaking, quilting and darning, to the aesthetic, for example embroidery – with a plethora of different types of stitches – yet there are fundamental similarities to all forms: There is a front and back; an element of male and female; there is a sense of continuity as the thread is pulled through the fabric, and often times a holding together. All of which can be metaphors for life. There is also an ancient idea of community as we imagine women sitting and stitching together, telling stories. The Great Tapestry of Scotland tells stories, but is in fact not a tapestry. A Tapestry is technically woven, but in the past the great wall hangings were copied, without the loom, and instead with the less expensive choice – stitchwork. The technical term for this stitchwork is crewel. The Prestonpans Tapestry by artist Andrew Crummy was the pivotal inspiration for The Great Tapestry of Scotland. Alexander McCall Smith (one of Edinburgh’s famous writers) saw it and considered – How about, in the grand tradition of Bayeux, a tapestry about Scotland for Scotland and by the Scottish people? There are 160 panels in all. All stories from Scotland’s extensive history, starting with the first panel depicting 420 million years BC and concluding after the formation of the Scottish Parliament, then the “North-wind blows/Geese/Ceaseless Sea” and ultimately a family tree like design for “the credits” . Alistair Moffat deliberately chose stories about Scotland’s people as opposed to just a list of battles or clichés from Scottish History books or political agenda for Andrew Crummy to then translate into images, sketches for the panels. Crummy’s beautiful imagery and geometry, portray historical vignettes, sometimes with names or words to help tell the story. 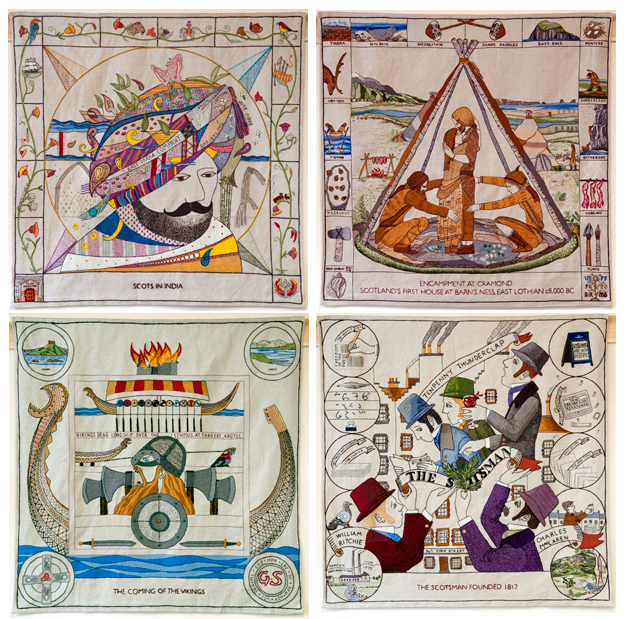 These sketches, along with individual cotton/ linen panels were sent out with packs of threads all over Scotland to volunteer groups and individuals, amounting to more than 1000 participants. This is a startling community project. The size alone is intimidating but from concept to completion a time frame of two years is astounding. Little groups of women, and I believe some men, gathered and researched their panels, finding links with their own lives to the often obscure piece of history in their hands to portray. I admire Andrew Crummy for his confidence in the many stitchers, leaving spaces for their talents and allowing their own wisdom and ability to dictate degrees of colour and stitch work. Queues of people waited patiently to look at the finished piece in its temporary home in the New Scottish Parliament building on the ancient Royal Mile, in Edinburgh and walking around the 160 panels laid out in a serpentine meandering, it is easy to see why The Great Tapestry of Scotland has become so popular. The size is impressive and at 143 meters long – the longest tapestry in the world – it would be easy to allow a Guinness book of records type of pride! But beyond that, Crummy’s delicious sense of space, line and form, never makes the tapestry boring or overwhelming. Some panels are intricately designed, and if you look closely, hands that seemed to be a landscape spring out and embrace the design. With flowing lines, the panels are never over complicated and never compete – there is always a sense of easy space and movement. There is an effortlessness to his designs that make it extraordinarily pleasurable to move from one to the next. On close inspection, the stitching is a marvel. All around there is chatter about the type of stitches used to express the sheen of a car or a ubiquitous Irn Bru can. Little features like stitching a darkened edge around the trousers of a man, who is wading through water exhibit the attention to detail and care of the many stitchers. The overwhelming amount of work is recognisable with each tiny stitch, that represent communities all over Scotland. Alexander McCall Smith’s intention was to create a tapestry about Scotland for Scotland by the Scottish people and there is something so powerful in that simple triad of intention. To me good art engages conversation, and a good community art project engages people through participation, however this tapestry brings something unexpected. It brings Scotland in a very deep, unselfconscious and real way back to itself. As if the stories shared by the stitchers as they stitched and explored the stories of the past, reflect our own stories in a an unending cycle of sharing and listening. As if now Scotland can see itself as a Nation again and Scots can see themselves as individuals, with stories interwoven in the past and connected to the greater identity of being Scottish. Having returned to Scotland after an absence of too many years, I have been struck by the silent and sometimes not so silent response to the increase in Europeans living and working here. I am told in hushed tones about small rural villages where only 50% of the children at school are actually Scottish, the rest being, so I’m told, Polish. I can taste the unease about such a shift in the demographics of Scotland and with the referendum just around the corner, the unease seems to increase due to this unknown population having power to vote in such a significant moment in Scottish history. Obviously having been an immigrant, an expat – for the best part of 20 years I am all too familiar with the concerns of being an outsider to a country’s desire to maintain a sense of cultural identity and strong sense of nationality. And so, what a time for Alexander McCall Smith to gift the nation such a strongly Scottish piece of art. As if to quell the fears that we will be lost in the swarm of Europeans – the tapestry is eloquent and loud in its rooted Scottishness. However, one of the reasons I am so passionate about art, is its ability to hold conflicting ideas in a way that might seem unimaginable. Andrew Crummy seems to hold all the insecurities and fears by leaving spaces in the latter pieces ‘to be filled in later’ or for subsequent panels to be added. 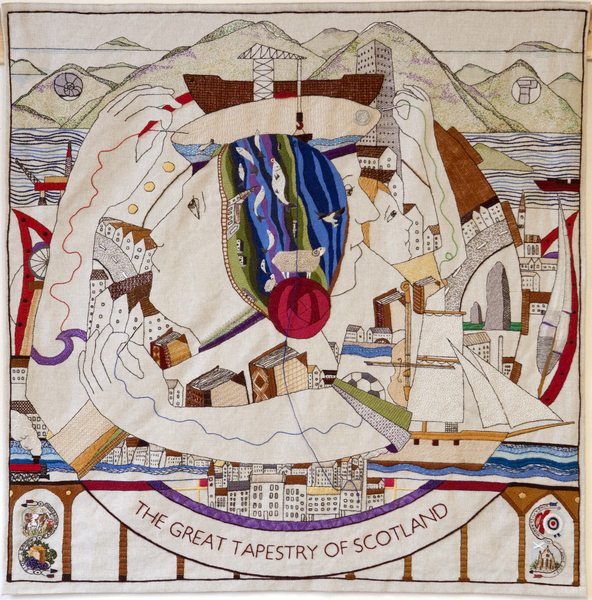 In other words the tapestry has the potential to show the changes as they happen: To recognise the shifting tides that have always been true of Scotland, and any country’s history. 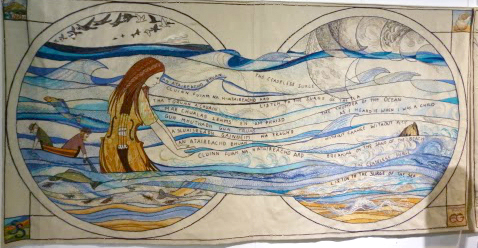 The tapestry shows Scotland: who we have been and who we are and most importantly allows space for who we may become. And like the multitude of stitches, all different, that together create this magnificent and important piece of art we can silently recognise and understand that diversity is implicit to life. I am moved by this; by the ‘Scottishness’ of it; by the way stitches can express individuality and the multiplicity of humanity; and how the blank canvas can hold space for the future – to me, this is the definition of Great in “The Great Tapestry of Scotland”.